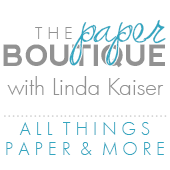 The Paper Boutique: Silhouette Portrait Giveaway! 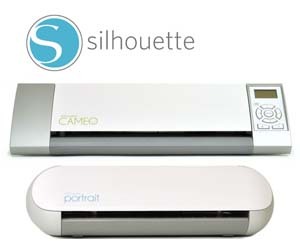 I am so grateful to Silhouette for sponsoring another Silhouette Portrait cutting machine giveaway! Also included in the Giveaway is a copy of the Silhouette Studio Designer Edition. One of my lucky subscribers or followers will win their very own Silhouette Portrait plus the Designer Edition software. Thanks Silhouette for your amazing generosity! Wow!! Scroll to the end of the post to see who won the Wine Charm giveaway! 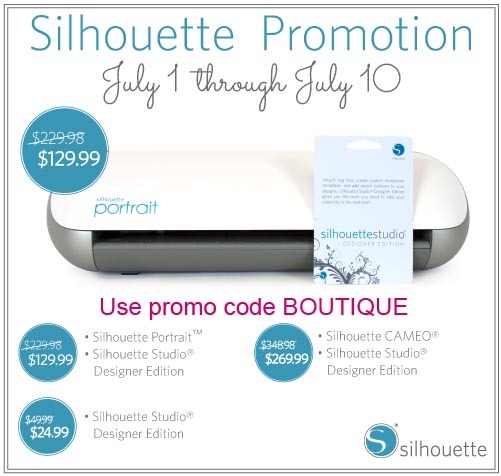 To enter to win the Silhouette Portrait cutting machine, you need to be a subscriber or follower of my blog. You can sign up over on the right side of this blog (if you are not there already). And leave a comment under this post, only one comment per person please. For an additional chance to win, please subscribe to my YouTube channel if you have not already, and leave an additional comment on this post that you did. You have until midnight MDT on Sunday July 7th to enter and the winner will be announced on Monday July 8th. Guess what? Silhouette is having a mega summer sale! Click here and type in the Promo Code BOUTIQUE when you order to receive the savings. For those of you that already have a cutting machine, you can purchase the Silhouette Studio Designer Edition Software (SSDE) for $24.99. This software is incredible and I use it on every project. I use the ruler tool for increased accuracy on every project including the ones below! The Studio Designer Edition software also allows me to import SVG files. To see a detailed PDF comparison between the Silhouette Studio software and the Studio Designer Edition software, click here. Did I mention that I love the advanced knife and eraser tools and you will too! The Silhouette Designer edition also gives you the ability to convert shapes into rhinestone patterns and sketch patterns and there is a cool tool called an eyedropper so you can to transfer properties between shapes and an adjustable pivot point rotation feature. Here are a few YouTube videos produced by Silhouette on their amazing Studio Designer Edition: their heat transfer materials. Here are just a few things my Cameo can do! It was the best purchase ever! You can make your own stencils. You can cut chipboard with the Cameo. Click here to see the original post. Vinyl cuts like butter! Click here to see the original post. Sketch pens are amazing too! Click here to see the original post. And the double sided adhesive is so easy to use! Click here to see my original post. My Cameo also cuts fabric. Click here to see my original post. These were just a few of the things my Cameo does, it cuts so much more! Remember the Promo code is BOUTIQUE and click here to order. Please feel free to spread the word and don’t forget to enter my giveaway! Love your sisters wine charm. Very pretty. I am a follower. Thanks for the chance to win! Congrats Scrapbook-ChickADoodle ! Please email your address and contact information to me at lkaisermt@gmail.com so I can send you the wine charm! Hi Linda, thanks for another chance to win the Portrait. I follow your blog and am also subscribed to your UT channel. I love your videos. First I'm grateful to You for an awesome blog and of course to Silhouette for the amazing giveaway! And of course I'm subscribed to your Youtube channel too! I love being a subscriber to your blog! Thank you for a chance to win a Silhouette, I have a Cricut and like it but I think the designs are geared towards people with small children, which I no longer have. I would love to win a Sihouette! I always look forward to your blog to see the latest and greatest! Thank you for all the fantastic ideas and tutorials you send our way! Today I open your post and another surprise ... a Portrait give-a-way, thank you! It's me again, I just subscribed to your Youtube channel. LOVE this machine! And tutorials are fab for inspiration and projects on what you can do w this gem! Thanks for the chance to with this machine! I am a follower of your blog. I also follow your YouTube channel. This is an amazing giveaway. I would love this machine to be able to do some of the great SVG cuts that are available. Thanks for a chance to win a Portrait. I am a blog follower. I also subscribe to your UT channel. Thanks for the inspiration! I am a follower on Facebook, You Tube and your blog! Thank you for the opportunity to win the Portrait! Thanks for another chance to win a Silhouette! I follow your blog and subscribe to your UT Channel. Thanks again! I'm one of your faithful followers because you always bring such great ideas. Wow! Another chance to win a Silhouette. I am a subscriber to your blog. Thanks for giving us a chance to win this fabulous machine!! I subscribe to your youtube channel. Thanks so much for hosting this! So excited for the chance to win a Cameo Silhouette! Thanks for the opportunity. Love your videos. I am a follower. I subscribe via email and love all your posts. Thank you for the great give away. I would really like to get my hands on the Silhouette! I will never pass up a chance to win a Portrait! It's hard to type with my fingers crossed! I have been a follower of your blog for quite awhile and have watched MANY of your videos! Again, thank you, and I'm hoping and praying! What a fantastic giveaway, thanks for the chance to win. I am a long time follower. I also subscribe to your youtube channel. Thanks again. Thank you so much for the chance to win! I love the little coasters you made. Also, I subscribe to your YouTube channel. Thank you and silhouette for another awesome givaway.I have been a subscriber for awhile love all your posts and videos thank you for doing them and have a great week. I just discovered your blog and already have learned a great deal. Thanks so much!! You make the Silhouette so very tempting! Thanks for sharing! What a wonderful giveaway. I would love to have this because I love delicate svgs and I know the silhouette would do them all justice. Subscribed and excited for the chance to win a Silhouette. Thank you and Silhouette for being so generous and the chance again to win the portrait would love love the potrait.Have enjoyed your videos and creativity. Thanks for the opportunity! I get your blog posts delivered to me via email! Wow!!! Love your blog and youtube channel! I am a follower of both and love to see what you create with the Sihouette!! Awesome machinge!! Thanks for giving us a chance to win. your blog always has great projects and inspiration. Would love to win a Silhouette Cameo, it would take my paper crafting to a new level. Thank you for another chance to win a Silhouette Portrait. I also follow you on your YouTube channel as well. Thanks again. You and Silhouette are so generous! Thanks for yet another chance to win! I am also a YouTube subscriber! I also follow you on YouTube! It is my birthday this month and winning would be a very nice birthday present. I follow you on your blog and the tube. Really both blogs and the tube. I'm a follower of your blog - would love to win one of these! Thanks for another chance to win the Silhouette Portrait! I'm also a Youtube follower. Thanks for all the inspiration! Thanks for another chance to win the silhouette. Being retired and having a Cricut, this is the only way I can afford one. I am a follower and subscriber. thanks again. Thanks for the chance! I'm a follower of your blog and YT channel. Would love to in. Happy July. Thank you Silhouette & Linda for a wonderful giveaway. I love receiving your newsletters and following your blog! I'm a youtube follower, too. Thanks! I love your blog and thank you to you and to Silhouette for the amazing giveaway! Loving your stencil projects. TFS. Thanks for the chance at the Portrait. Already a Youtube follower. Love you videos. Thank you for this great opportunity to win a Silhouette portrait. I have already subscribed to follow your blog and your you tube channel. Wow! Another chance for a Silhouette! They are so generous! Thank you for hosting all these giveaways! Thanks for another chance to enter and win the silhouette. Thank you for the chance to win the Silhouette Cameo. It really seems like such an awesome machine. I hope I win! thank you for the opportunity! So excited for the opportunity! Thank you! Awesome! Thanks for the chance to win. I am an email subscriber to your blog. Thanks for the second entry opportunity! I also subscribe to your YouTube channel, as well. Thanks for the chance to win the baby cameo, gosh how I could use that when going away for 3 months in the winter. So nice of you and Silhouette to offer these wonderful giveaways! You betcha I follow on utube. Love to actually SEE what your up to. Thanks for another chance to win. Thanks Linda for another chance to win. Maybe one day will be my lucky day. Love your blog and your youtube channel. wow, I'd love to win! I follow your blog on feedly. What a wonderful giveaway! Thanks for this opportunity! I am a follower of everything, your YouTube, blog and I get an email every time you post. Wish me luck! Thanks again Linda - these examples are all so amazing. I am a follower here and on facebook! I am already a UTube subscriber...thanks for the chance to win! Thanks for the chance to win! I would love to have a Silhouette! Oh how I would love to have a Silhouette. Thanks for a chance to win such an awesome tool. Thanks so much for a chance to win the Silhouette Portrait! I check in with you almost every day and so enjoy your videos. Would love to have a Silhouette -- thanks so much for the chance to win one! I'm also a subscriber to your YouTube channel. Linda, thank you for the opportunity to win a Silhouette! I've heard amazing things about it. Thanks for another chance for winning this fabulous giveaway. I'm crossing my fingers....and toes. Also thanks to Silhouette. BTW, I just subscribed too your YouTube channel & am pretty sure my afternoon will be spent watching videos! Awesome giveaway! I just love your blog and have been a follower for some time...so much useful ideas and information! I am also subscribed to your Youtube channel! Thanks for the chance to win! What an awesome giveaway! Linda, another awesome presentation! I love these beautiful doilies you have created with the Silhouette. Thanks to you and Silhouette for the opportunity to win a Portrait. I would love to have the opportunity to use one! Thanks again. You always inspire me, here and on your YouTube channel! Thanks for the chance to win a Portrait. Such an awesome machine. Follow your blog and enjoy your posts! Thanks to you and to the Silhouette company for giving away another Silhouette. I'm a follower on your blog, U Tube and Pinterest. Just love so much of what you do! OOOOh How exciting another giveaway!! I'll keep trying those cuts are amazing! I subscribe..Thanks for a chance to win one of these awesome machines.. Thanks for the chance to win! I would LOVE a Silhouette! I would be in 7th heaven if I won a Silhouette! It looks like such a fantastic machine and would be a wonderful complement to my Cricut. I'm a follower, Linda! Thanks so much for the chance to win. One more comment to let you know I am a subscriber to your YouTube channel. Love your videos and watch every one of them! Thank you and Silhouette once again for the chance to win a Portrait. I would be so thrilled to own one. I am a follower and love your videos. One more comment to let you know that I also subscribe to your YouTube channel. I love what you did with jar lids...very creative and I am sure possible because of your Silhouette. I'd love to own one too. Thank you for the giveaway. I subscribe to your page as "Salt & Pepper Makers"
One more comment to let you know that I also subscribe to your YouTube channel as Cardamama. How fab would it be to win a Silhouette, it does so many crafty things. I'm also a subscriber of your Youtube channel. I'm one of the many who are subscribers to your You Tube channel and look forward to your videos. "Silhouette, silhouette, silhouettes on the shade . . ."
Thanks to all those making this opportunity available. Keeping my fingers crossed. Another fantastic opportunity from Silhouette. I am now going to your You Tube channel to become a subscriber. My birthday is this week. This sure would be an awesome present! Thanks for the chance to win! ohmygosh Linda - you blog is fabulous, then you offer this fantastic prize! Yay! Thanks for the chance to win. Love to follow your blog. I have been a follower for quite sometime now, would love to win the silhouette cutter as it had been in my wishlist for long ... Fingers crossed! Thanks for this wonderful giveaway! This would be so much fun to win. I subscribe to both your blog and youtube channel. What an awesome giveaway ... would love to win a Silhouette Portrait! I am a follower of yours thru Bloglovin. I've been a follower of your blog for a while now, and I always look forward to your posts. Thanks so much for sharing your ideas! Thanks, too, for a chance at an awesome giveaway! Hi hi. I've been a follower for some time now... Oh my: I'd love to win a Silhouette. I hear they cut very very well. Thanks for the opportunity. I love getting my emails letting me know when you post on your blog so I don't miss any of your inspiration. Thanks for the chance to win the Silhouette. I'm crossing my fingers that I win so I can give it to my friend who doesn't have one. Linda~Just subscribed to your you tube so I can have a 2nd chance to win the Silhouette Portrait for my friend. Thanks for the awesome giveaway on your blog. Thanks for the chance to win. I would love love love one of these machines. Thank you, Linda for the chance to win an awesome tool! I love your blog...I am a subscriber. Thanks for the chance to win this fabulous tool. I follow your blog and am already a subscriber of your YouTube channel. I am also a subscriber of your blog. I thoroughly enjoy your projects and tutorials. I would love to win a Silhouette Portrait! Thank you for the chance. I already follow your blog. I already subscribe to your Youtube channel. Thanks for the wonderful giveaway. thanks so much for the chance to win i'm already a follower. Hi Linda! I remember all of these lovely projects :) I enjoy following your blog and watching your videos! Thanks so much!!! Thanks, Linda, for the opportunity to win! I have been a follower of yours for a long time. I subscribe to your blog and channel. Thanks for another chance to win.Fingers crossed. Very exciting I was actually looking for blogs to follow since I am brand new to this I am loving it already and what an amazing opportunity I own a cricut and I love it but I am curious about the silhouette thank you for offering this !!!! I am a follower on this blog and on YouTube ! Thank you for sharing with us all those great projects and ideas. I own a die cutting machine but have been very intrigue with the Silhouette machines. Would love to own one but winning will be the only way for this to happen right now. Thanks to Silhouette and you for this giveaway. Thanks again for the opportunity to win! I also both follow your blog and am subscribed to your helpful videos on YouTube. Thank you so very much for those! Thank you Linda for your awesome videos and all the great ideas you share with us on your blog. I discovered you by chance and am so glad I did! Like all the followers, I too would love to win the Portrait machine and be able to attempt a lot of the things you show us how to make. It looks like a fabulous machine! Thanks so much for the chance to win Linda! I love your blog and your giveaways! Thank you for a chance to win!! I love your blog! I'm a youtube subscriber! Love the fact that I can watch your videos and get some awesome inspiration. Thanks, Linda, for the chance to win a Silhouette! All the things it can do sound really foreign to me, having never even seen one IRL, but it sure would be fun learning them! ;) I'm still following you, but with Bloglovin' now that Google Reader is gone. Thanks so much for the chance to win, already a follower! I am now a subscriber on your Youtube channel! I am already a subbie to your yt channel and will follow your blog as well. Thanks for this opportunity. I'm a follower. Thanks for the chance to win a lovely prize. You inspire us all. Linda - I am a subscriber of your blog and youtube. Love your projects and ideas. Would love to have one of the machines and thanks for the chance to win. would love to win a silhouette! Have been wanting a Silouette for a while now. Have been entering every possible giveaway and I hope this is the lucky one. Thanks for another chance. Thanks so much for the chance to win. I would love a silhouette for my craft room! I love your blog. Thanks for all your awesome posts! I'm a follower and would love to have a cameo. I love all the projects you share on the blog. Thanks for the chance to win a Portrait! I would love to own one! I just subscribed to your YouTube channel. Your videos are great! Have a great holiday. Love your videos. Thanks for all you do. What fabulous projects! The tin and napkin are my favourites. Thanks for this opportunity to win a Silhouette! Thank you for this opportunity, Linda. I'm already a subscriber on your YouTube also! I have been a follower for a while now...thanks so much for the opportunity to win! I am a subscriber to your Youtube channel...thanks so much for the chance! Thanks for a chance to win a great little machine and all the wonderful videos. I am a subscriber to your YouTube channel and thanksfor another chance to win a great machine!! I would love to win the silhouette portrait! Thanks to you and Silhouette for this opportunity! I have also subscribed to your YouTube channel! I have learned so much from your awesome blog! It's wonderful! Just stumbled on your blog while working on daughter's wedding projects and using my new Silhouette. Became a subscriber! I would love to win the Portrait. I have used the cricut for years but have heard so much about Silhouette it would give me a chance to try it out. It would be so awesome to win this machine. Thanks for all you teach us. What fabulous creations you come up with. Wow! I would love to win a cameo and thanks to you and silhouette for the chance. At 74 I feel like a whole new world of creativity has opened up to me. Also checked out your U tube. Keep up the great work. Thanks for always having such generous give-aways! I can't wait to finally win something! Have a fabulous 4th!!!! Wow, is this competition open to the UK? I've entered before when you have given these away and would love to win! What an awesome give away Linda! I love your blog. You always have helpful information and great projects. Thanks for giving us an opportunity to win. Hope you have a blessed 4th!